I scored these awesome smelling candles from T.J. Maxx a few weeks ago, they’re made by this brand called DW Home based in California, I’ve never heard of them but I’m really glad I stumble upon them! I love the minimalist branding and packaging, and for those of you that knows me know that a good packaging design is definitely one of my weaknesses, especially ones I can save and use for other purposes later on (I’m envisioning one of them being my new brush holder and the other a mini flower vase for the room!). The woodwick is unlike any candle I’ve ever purchased, I was kind of skeptical at first thinking it will burn through the candle really quickly, but I’m pleasantly surprised and almost think I prefer the woodwick because since they hold their shape you don’t have to worry about it burning off center and creating an uneven burn in your candle. 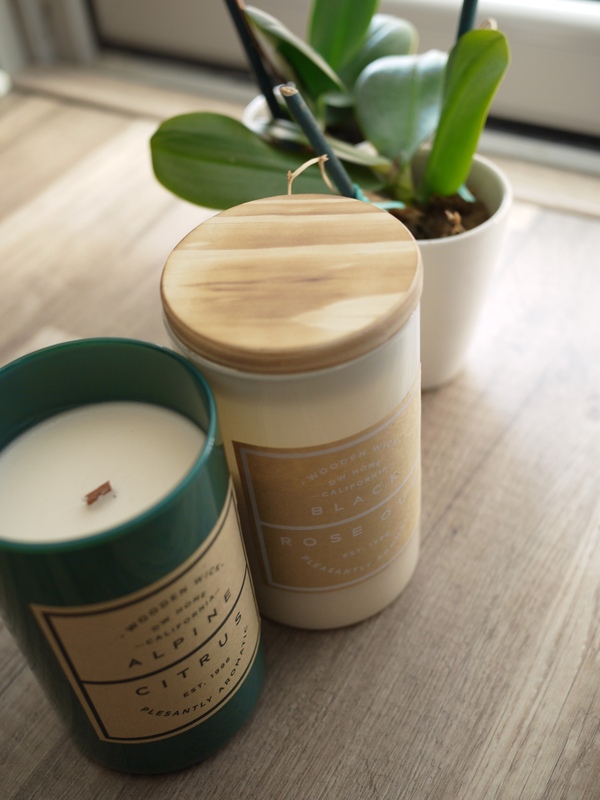 I love them both, but right now I especially love the Alpine Citrus because it reminds me of Christmas, and sitting by the fire with a big Christmas tree by your side is one of the most relaxing scene I can think of during the colder months. The Black Rose Oud is also very beautiful, more on the sweet floral side that will be very fitting for spring. I don’t think they’re widely available yet, so if you’re interested in trying one make sure to keep an eye out when you’re at T.J. Maxx! I am such scented candles lover! Same! They are a great addition to any room/home! I know! You just have to constantly check back… I did see them restocking some at the TJ Maxx near me, so maybe they will have some at the ones near you soon!